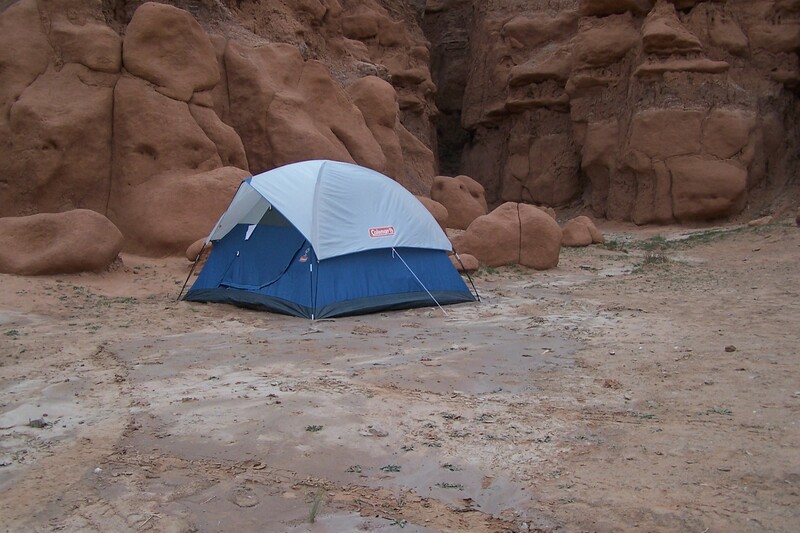 We were camping at Goblin Valley and after careful consideration, I chose the above spot for my tent. There was shade, sandy terrain, and flat ground. I would be fine. Sure it could rain a little but how bad could it be? Turned out it didn’t have to rain all that bad. Just a torrential downpour for ten or fifteen minutes created flash floods roaring off the rocks. What you don’t see in this picture is my carefully dug trenches because they were all washed downstream. The sand was piled about eight inches deep at the back of the tent. How my $25 clearance tent survived the onslaught, I don’t know but everything inside was dry. I learned my lesson. Now I only set up my tent in a flood plain if I’m 100 percent sure it won’t rain.